Have you ever overheard a conversation that just makes you wanna cringe? Like, those people in the restaurant booth behind you are talking about something that you actually know a lot about.. and they’re acting like experts.. and they’re just plain wrong.. and it’s taking everything inside you not to turn around and correct them? Yeah, that’s how I feel about some of the misinformation being passed around about running an Etsy shop. So let’s set the record straight about some of the most common Etsy myths I’ve heard. Myth #1 - Your “most important” tags should be first. Nope. Tag order DOES NOT MATTER. The most important thing about tags is to make them as searchable as possible. This means using phrases more often than single words, and instead of repeating the same words a bunch of times over and over, do your best to diversify! The more searchable phrases you use, the more likely you are to get found in multiple different searches. Pro tip: Etsy has also said that title order doesn’t matter.. however, I do recommend putting your most important key phrases at the beginning. Your entire title doesn’t show in search results, so you need to make sure buyers know exactly what you’re offering in a quick glance. Myth #2 - The shorter your title, the better (aka title “stuffing” is bad). Okay, so yes.. awkwardly weird title stuffing that doesn’t make sense is bad. But appropriate title stuffing with actual quality keywords and phrases is GOOD. Here’s an example. This only allows you to be found when a buyer types in “unicorn”, “keychain” or “unicorn keychain”, which means they have to know exactly what they’re looking for when they run a search. You want to give yourself lots of different ways to be found, so consider including some additional keywords and phrases that describe the item - color, size, giftee, etc. Mmmhm. Lots of keywords in here. Good, right? Wrong. It’s basically just a random stream of words. Etsy rewards listings with actual searchable phrases that match what buyers are looking for. Take these words and try to organize them into multi-word phrases. There are TONS of searchable words and phrases in this title, but they actually make sense. They make up phrases that buyers will be searching for, and Etsy rewards listings that match buyers' searches very closely. Myth #3 - You should copy your title into the first line of your description to boost your SEO. Sorry to burst your bubble, but descriptions don’t actually factor into Etsy SEO. You should use your descriptions to sound like a human, so when a potential buyer clicks in to find out more, they’ll get a little of your personality. Myth #4 - Don’t use the same key phrases in multiple listings because you’ll compete with yourself in search. Read this part carefully - it is simply not possible to compete with yourself in search. Now repeat it back to me - it is simply not possible to compete with yourself in search. It is, however, possible to show up in a single search multiple times. And to do this, you actually NEED to use the same key phrases in multiple listings. If a buyer happens to miss you on page 1 or 2, maybe they’ll find you on page 3! Myth #5 - SEO is the only marketing method that works. Honestly, SEO is only half the battle. Did you know that even if your SEO is on point, there are a ton of other factors that play into your search page ranking? I’m sure you’ve noticed how some sellers seem to stay at the top of search pages, snag coveted spots in Etsy Browse Guides and Etsy Finds emails, and rack up crazy amounts of sales. It’s all due to a phenomenon I like to call the Popular Listing Circle Effect, and you can learn all about it in my FREE guide, which will give you some pro tips on how to give your listings a boost in Etsy’s complicated search algorithm. What other rumors have you heard about running an Etsy shop? Let's bust some more myths, y'all! It can be crazypants watching your monthly stats go on an actual rollercoaster ride. And I’m not talking about one of the fun, smooth, family style rollercoasters at Disney World.. I’m talking about the make-you-pee-your-pants rollercoasters that take you up to a super high peak and then plummet you straight down to certain and eventual death. Dramatic? Maybe. Stressful? Definitely. Here are some real life numbers for ya. Here’s the thing, though. You’re gonna have slow seasons. You’re gonna have rollercoaster-looking stats. But when you add up those 4 months, you still come out with an average of $4,500/month. Not too shabby, eh? It is so important to take advantage of the peak selling times so you can rest and recharge in your slow selling times. believe it or not, Slow selling times are actually crucial to your creative process. When we’re in the middle of a selling frenzy, we’re in maintenance mode. We’re packaging orders, responding to inquiries, and doing everything we can to keep up with our processing times. Often, there’s not a lot of extra time to dream or design or create. That’s why when you DO have a slow month or two, take advantage of it so you can rock the heck out of your fast months. So stop staring at (AND CRYING OVER) your stats. Do these 5 things instead. 1. Brainstorm a new product line for an upcoming season. Check out Etsy’s Key Shopping Dates (Shop Manager → Marketing → Key Shopping Dates) to see what they’re planning on promoting, and when. Get some ideas for new products or variations of current ones, and get to work! This is a perfect time to test out some prototypes, spend a full day being creative, or redesign an old item that needs a facelift. 2. Update your photos on a listing (or several) that's been in your shop for a while. 3. Make sure your tags and titles are relevant to the current time of year. If it’s June and you still have “valentine’s day gift” as a part of your title, it’s probably time to get in there and do some editing. (I’ve definitely been guilty of this one before!) Think about what holidays or seasons are coming up 2, 3, even 4 months from now, and go ahead and get those keywords changed out. Obviously when your SEO is on point, you have a better chance of showing up on the top of search pages, which will give you maximum exposure at peak times of the year. And let’s be honest, SEO is only half the battle, so if you haven’t checked out my newest freebie, you definitely need to! You’ll learn about what I call the Popular Listing Circle Effect - a phenomenon that successful sellers have all figured out how to take advantage of, AND you’ll get some actionable tips to boost your listings, EVEN when your SEO is already awesome. Seriously, grab it right here. 4. Try out a targeted offer. Slower seasons mean less people are coming into your shop. That’s why it is critical to give potential buyers that ARE browsing around an extra incentive to complete their purchase. You can try out an Abandoned Cart promo or a Favorited Item promo. Watch this Facebook Live if you have no clue what I'm talking about. (Both can be found in Shop Manager → Marketing → Sales and Coupons.) Start your budget low and see how it goes. If it’s effective, ramp it up! 5. Create new listings for a bundle of items you already have. So remember, slow seasons can be a blessing in disguise, if you know how to make use of your extra time. Don't forget to breathe and schedule some me-time in there, too. You deserve it. etsy's new fees are causing sellers to panic! here's what i'm doing instead. So, if you haven't already heard.. on June 13th, Etsy announced a massive change to their existing fee structure that had sellers immediately up in arms. In mid-July, Etsy will begin taking a 5% commission off of your total sale price (item + shipping). Since its founding in 2005, Etsy has taken a 3.5% commission off of your item price only (not including shipping). The $0.20 listing fee remains the same. They also announced monthly subscription plan options, called Plus and Premium, which will give sellers more tools to run their shops. All of the current features Etsy offers are included in the Standard plan (which is still free), and nothing will be taken away once the Plus and Premium options are opened up. Plus starts at $10/month and will increase to $20/month in January of 2019. Additional features include more robust customization options (banners, featured listings, etc. ), a 50% discount on a custom URL (which means you'll be able to send buyers to a dot com instead of an Etsy link), discounts on marketing materials and packaging supplies from Etsy's partners, the ability to email your customers when a sold out item is back in stock, and bonus credits to spend on listings and promoted marketing. Initial (and completely natural) reaction = TOTAL PANIC MODE. I've been doing this since 2009 so I've weathered my share of big announcements and changes. So after the initial shock wears off and we realize that Etsy's gonna do what Etsy wants to do, we need to learn to roll with the punches. So instead of hanging out in the forums, getting sucked into the black hole of negativity, and stewing over what many sellers are saying is totally unfair, here are 3 things I'm doing instead. You gotta know your numbers, y'all. What does this increase mean for you and your bottom line? How much do you need to raise your prices (if at all)? Here's an example of how I'm going about this. Let's do the math on something at a higher price point, shall we? An item sells for $50. Shipping is $10. Under the previous fee structure, Etsy would charge $1.75. Under the new fee structure, Etsy will charge $3, which is an increase of $1.25. So to cover your new fees, raise your $50 item to $52 or your shipping from $10 to $12. Those extra $2 are NOT going to scare away your customers. Etsy released a list of their Key Shopping Dates for the rest of 2018, and when they give you this kind of golden information, you better listen up. Take a good hard look at these (inside your Shop Manager --> Marketing --> Key Shopping Dates) and see if you can tailor your existing listings to fit these categories or expand your product line to include some new offerings. I recently did a Facebook Live where I went into a little more detail about upcoming buying seasons and trends, so check that out when you get a minute! I get it. Things are changing, and that can be super scary, but one major thing is staying the same - how you get found in search. Etsy has stated that choosing a monthly plan will NOT give sellers an advantage in search, so you can rest easy knowing that if Plus or Premium are not for you, you won't be penalized. The best way to get your listings in front of your dream buyers is STILL making sure your SEO is on point by using searchable key words and phrases, filling up your entire title, using all 13 tag spaces, and staying current and relevant with seasonal items. 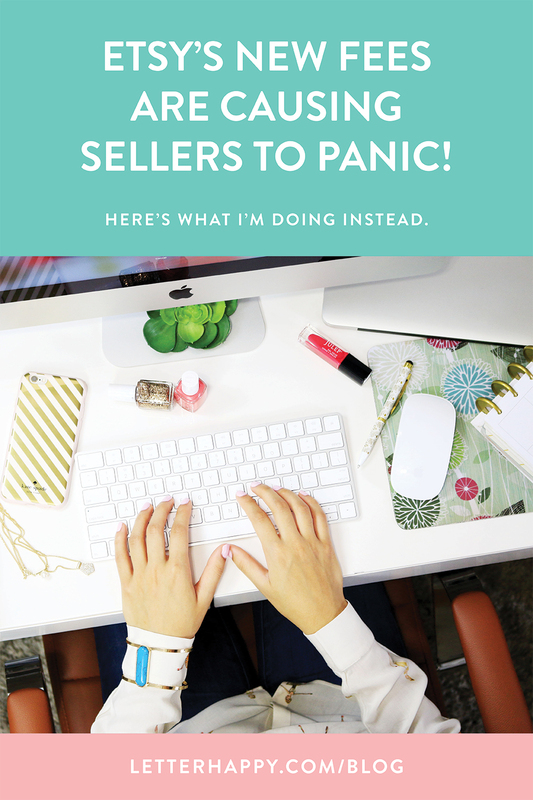 If you're baffled by how successful sellers get and keep their items at the top of search pages, you'll definitely want to grab my newest freebie, where I talk about the phenomenon I've dubbed the Popular Listing Circle Effect (or PLCE - I love a good acronym, don't you?). Not only does it explain why these sellers are constantly on top, it gives actionable tips on how to get your listings there, too. So what are your honest thoughts about the updated fee structure? How do you believe this will affect your shop? Do you think good things can come out of this in the future? Leave a comment here, or.. as always, we're having (positive and productive!) discussions over on Instagram and inside the shophappy society Facebook page, so come join in the chats over there, too! Talk soon (and keep calm)! Raise your hand if you make resolutions EVERY SINGLE YEAR and by mid-January, you’re right back where you started. So this year, instead of “resolutions” per se, I’m focusing more on goals and affirmations for 2018. I’ve divided them up into Etsy biz goals (things I want to accomplish in both of my shops, letterhappy and happytatts), Etsy coaching (providing even more awesome content to help you grow your own Etsy biz), and life goals (centering mostly around healthy habits and mindfulness). Way back in 2009, I started my shop with greeting cards and 8x10 prints. At the time, art prints were a huge seller, but the landscape has changed a bit and these days, DIY printables are more in style. I’ve officially changed all of my old print listings over to printables, and I plan to offer many more in 2018. More passive income for me, less printing and packaging time for me, and faster delivery for my customers. Win-win..win! This is something I’ve been meaning to do for a while. It will definitely take some time, but by taking a look through my stats, I’ll be able to tell which listings aren’t performing as well as they should, and either see what I can do to improve them, or cut them loose. While checking my stats for non-performers, I can also identify my best-sellers and create more variations of those. 2018 will include an editorial calendar, mainly focused on Instagram and Instagram Stories. It’s my favorite social media app, but more often than not, I find myself consuming content instead of creating it. My Instagram feed is highly curated, so I’m contrasting that with behind the scenes silliness and biz tips on Instagram Stories. Little nuggets of Etsy biz goodness are coming your way, starting soon! Short and sweet action tips for you to take advantage of, because I know you’re a busy human who needs to get the info and get on with it! Follow my biz page here. The next step to Etsy success is learning how to SEO. I’m already knee deep creating an advanced course as a companion for Etsy Empire: The Foundation. This will be for the serious seller who wants to up his/her game and get into the nooks and crannies of everything Etsy has to offer. I started practicing yoga in June of last year and I was immediately hooked. I fell off the wagon during November and December (holidays, am I right?) so one of my number one priorities is to make time for it in my schedule no matter what. I go to a local studio less than 5 minutes away from my house, so there’s really no excuse. I played around with the free version of the Headspace app a little last year, and I can already say with full confidence that at least 10 minutes of meditation per day will do wonders for my mental health. I just recently upgraded to the paid plan, so I’m looking forward to an entire year of mindfulness. I can’t say that I actually enjoy running, and to be honest, I have zero ambition to EVER run anything over a 10k. But I can definitely see (and feel!) the physical difference in my body when I do run regularly, so having a concrete goal to work towards should help keep me on track. I use the Runkeeper app (in conjunction with my Apple Watch) to track my runs. I’m a proud annual passholder, and it’s no secret that I looooove me some Disney World. Plus, taking the kind of vacation that keeps me constantly moving forces me to unplug from work. (self love and Mickey Mouse for the win!) I’m already planning for 2 trips (one in February to cheer on my best friend as she runs a half marathon, and one in April to stand in another best friend’s wedding) so I’m halfway there! Okay, this is definitely the most resolution-y of my “resolutions”. To be honest, I’m not generally an unhealthy eater, I really only drink water and coffee (no soft drinks for this girl! ), and I’m not even an every-single-day Starbucks junkie. But I could stand to make healthier choices more often, drink way more water, and cut down on the $5 drinks. Not only will it be better for me, it will save a pretty good chunk of change. Alright, y’all. Keep me accountable. 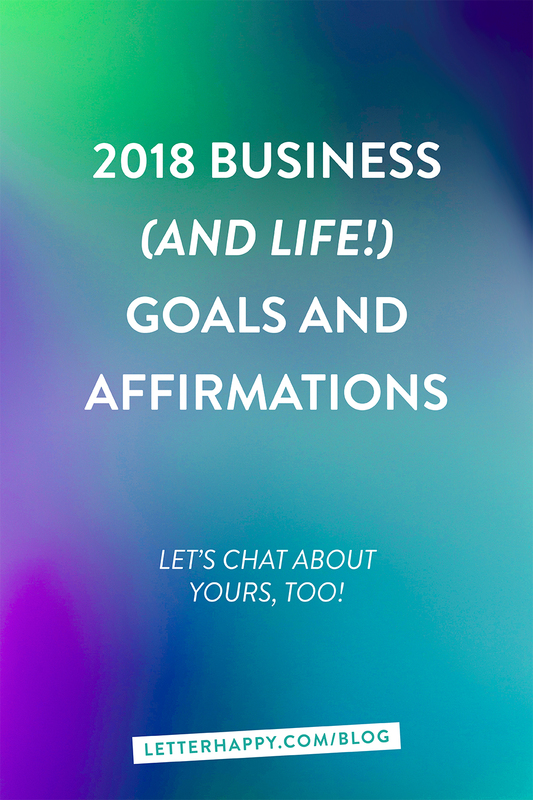 Come hang out with me on Instagram or leave a comment below and let’s chat about YOUR resolutions, goals, and affirmations for 2018! 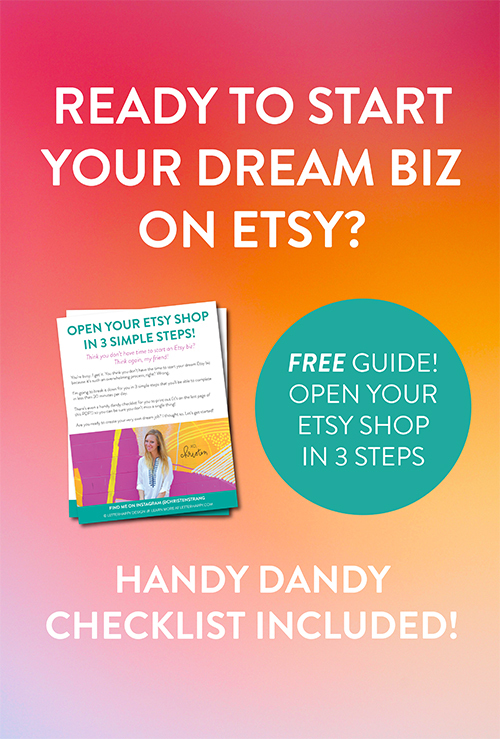 Is one of your 2018 goals to finally open up that dream Etsy biz? 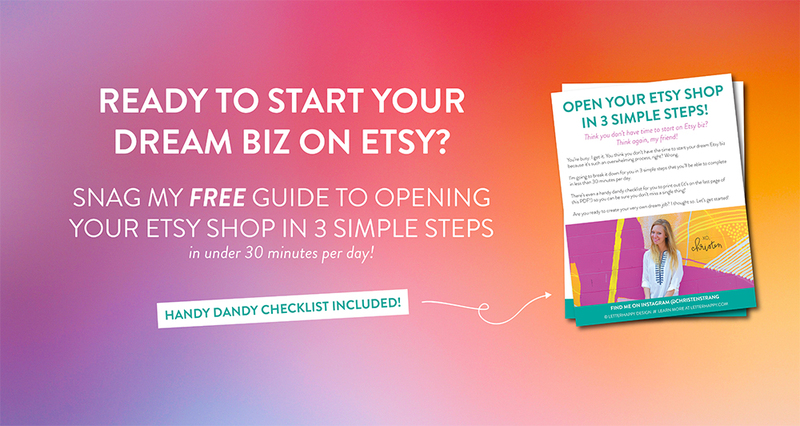 Snag my FREE guide to opening up an Etsy shop in 3 simple steps and let me help you make that happen! *Links to Headspace and Runkeeper are affiliate links, which means if you decide to click and make a purchase, I may receive a small commission. I have not been compensated for any opinions shared above, and will never share anything that I don't actually use myself or highly recommend.